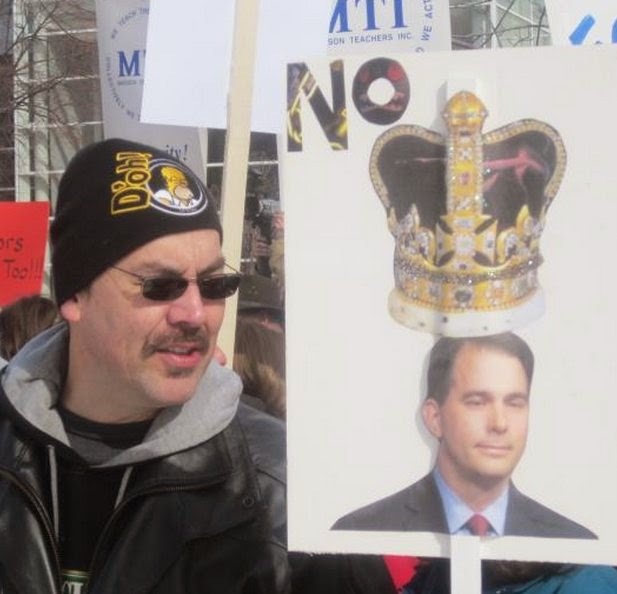 DemoCurmudgeon: Walker quest for ultimate power hits constitutional road block; State Superintendent duties safe for now. Walker quest for ultimate power hits constitutional road block; State Superintendent duties safe for now. Scott Walker and our constitutional conservative Republican majority lost a court battle to twist another one of our constitutional laws into something completely unrecognizable. In Scott Walker’s quest for ultimate power, where he challenges all current interpretations of the state constitution, his take down of the Superintendent of Public Instruction failed...so far anyway. WISC: Court affirms part of Walker rules law unconstitutional: Republican Gov. Scott Walker signed a law in 2011 that requires state agencies to get gubernatorial approval before drafting new administrative rules that create policy. Teachers and parents filed a lawsuit in 2011 alleging the law was unconstitutional as applied to the state Department of Public Instruction, arguing it gives other state officers more power than the elected DPI superintendent. A Madison judge in 2012 found the law unconstitutional as applied to DPI. The 4th District Court of Appeals upheld that ruling Thursday. A spokeswoman for the state Department of Justice, which is representing the governor's office, says the agency may appeal to the state Supreme Court.